Following the great success in 2018, when NEC's stand won the Best Stand Award during ISE, we are continuing our partnership. In 2019 NEC's motto is "Start here" and the journey through the NEC world was developed by us. On this journey, visitors will be taken through a world full of technological innovations. And as befits a journey, the action must not be neglected either. In various retail scenarios, customer journeys will be run through, focusing on the product. Shop situations are designed to be as real as possible. Real products from the fashion and sports sector make shop situations as real as possible. This explains the function and benefits of NEC solutions to visitors directly at the POS. In the field of office communication, the experience character continues. High-quality meeting rooms make it possible to experience the bringing together of people from all over the world. The motto "Start here" as a call for departure is visualized externally by the unmistakable appearance of overseas containers. 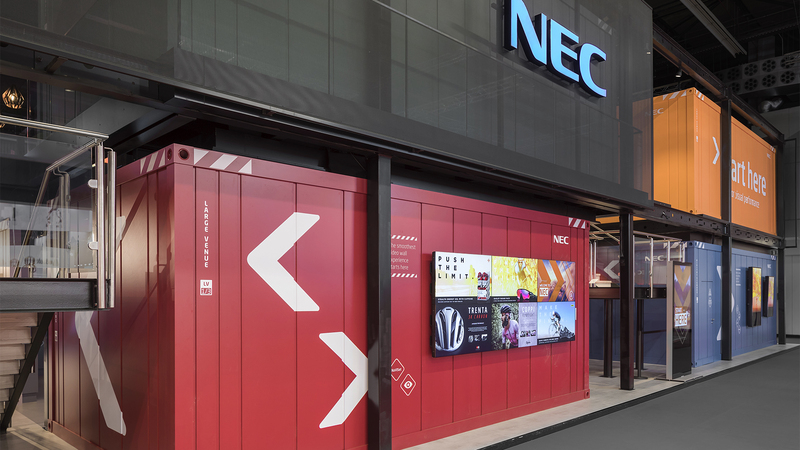 The result is an eye-catching and exciting journey through the NEC brand world.